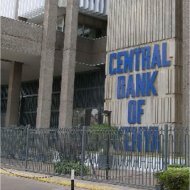 The Central Bank of Kenya (CBK), founded in 1966, sets interest rates, handles the country's money supply, regulates the overall banking industry and often also loans out money to commercial banks and the government itself. It's a central bank similar bank to what most countries in the world have. The CBK also manages the country's foreign exchange reserves and regulates the money market. The Central Bank does not operate any facilities for the general public, other than the selling of commemorative coins, and the redemption of mutilated currency. During the colonial period of eastern Africa, the East African Currency Board was the governing body for finances and currency for the British colonies of Kenya, Tanzania, and Uganda. This board was disbanded in 1966 when these countries became independent and required their own central banks. At that point, the Central Bank of Kenya was established. The CBK is headquartered in Nairobi, with branches in Mombasa, Eldoret and Kisumu. The bank is managed by a Board of Directors, with 8 members. All members are directly appointed by the president of Kenya. 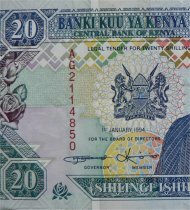 It has limited autonomy and independence from the Kenyan government, which was further extended by the amendment to the Central Bank of Kenya Act in 1997. The first banking crises of an independent Kenya began in 1983, and led to the creation of a fund designed to insure bank deposits as well as dealing with insolvent banks. It took several years for the fund to be developed enough to handle large financial failures, but by the early 1990s it was a fully-functioning part of the Kenya economy. One aspect of the CBK is the Kenya School of Monetary Studies. The school was founded in 1997, and offers a range of professional degree courses in banking, technology and management. Their Management Development Center runs shorter courses and seminars to advance the skills and knowledge of those already in the banking or finance field. A series of bank failures in the 1980s prompted the creation of the school to encourage sounder banking policies. The school is owned by both the CBK and the Treasury. The campus is located in Nairobi. The Central Bank of Kenya maintains a (terribly slow loading) website, that offers current financial information, such as currency exchange rates, interest rates, bond values and financial news for the country. Downloads are also available with budgetary reports, economic reviews, annual financial statements and other relevant publications.